If you already use the Divio platform, then you know we provide what we think is the best and most optimised platform for Django. Django has been in our DNA since we launched django CMS around ten years ago and we use it almost exclusively to build the Divio platform. At the same time, other technologies continue to grow and evolve so to that end, and we have also supported Node.js as a convenient boilerplate feature. We are happy to announce that with our latest release, we have bumped Node.js to its own platform complete with an Express.js project to help speed up the initial project creation process. We have given it the tentative label early access since, while all the features and support of the Divio platform are available, we are in the process of building up an extensive ecosystem of addons. Our addons provide drop-in functionality for popular website features and help speed up development. If you are using Divio already then you might well be wondering.. does this mean less support for Django going forwards? We will be keeping up our promise to provide the best Django development platform and building a team of true Node.js experts to equal our 100% happiness rated Django support. Our support is something we think makes us a top choice for Django - no call-centres or support scripts, rather a core team that is passionate about Django. We will be providing the same for Node.js. In our first Node.js release, we include a new Express.js boilerplate that gives you a pre-configured and barebones Express site complete with some basic routing. It's a great way to bootstrap an MVC project and gets you to a working Node.js / Express based website. 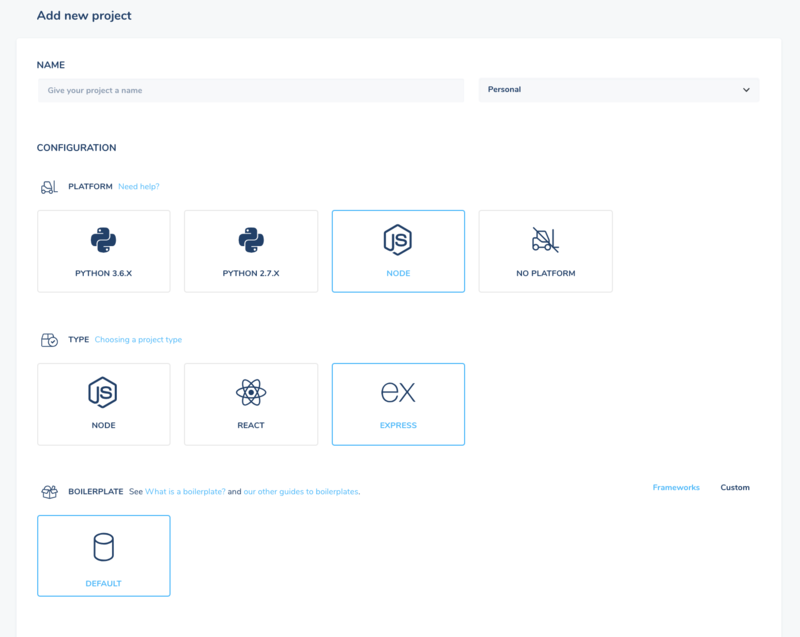 In the Express.js boilerplate, you will also find a database example that shows how to connect to your projects included Postgres instance using the common Postgres client package. All the same easy-to-use Divio platform features are available including the Divio Desktop tools, built-in backups, unlimited collaborators and support for Git-based repositories. Perhaps best of all, Node.js is available for our free and $4 economy plans which we think makes it one of the most cost-effective ways of deploying and running Node.js app. With flat-rate pricing, you dont have to worry about unexpected costs and digging through services trying to find out where costs are coming from - everything is centralised in the Divio Control Panel. A great way to start is with the quickstart guide that will get you to a running Node.js website is just a few minutes. You can find Node.js now in your Divio Control Panel!